Do your company’s pre- and post-sales content teams coordinate their efforts, reaping all the benefits that can come of doing so? Or do the teams work on their own without much communication, maybe without even knowing each other’s names? I’d guess that you’re nodding at the second question. It’s rare that I hear of these teams working together. When I do, as happened at the Intelligent Content Conference, my technical writer’s heart goes pitter-pat. At ICC, Andrea Ames gave a talk ­– Closing the Gap Without Falling Into It – on IBM’s efforts to close the gap. In her case, the gap takes the form of marketing on one side and tech communication on the other. In other companies, the sides (aka silos) go by different names. Whatever names your company uses, the idea is generally the same: Presales teams sell. Post-sales teams explain. Rarely the twain shall meet. This post sums up Andrea’s main points, including her insights and images. In theory, when content teams work together, everybody wins. Internally, team members share ideas and expertise. They coordinate their deliverables. They reuse each other’s content. They use words the same way and view audiences the same way. Efficiency and cross-fertilization rule. Externally, prospective customers and customers get exactly the content they need, in the forms they need it, at all touchpoints – and they go out and bring you new customers. In practice, no company ever realizes all those benefits perfectly. The more you want to realize them, the more committed you must be to extraordinary cross-silo communication. That’s what it takes to close your gap. I see one nice, continuous journey. We’re just not implementing content that way. In other words, marketers do their companies a disservice when they consider only the presales stages of the customer journey, which Andrea labels discover, learn, try, and buy. Savvy marketers don’t stop at the buy stage. 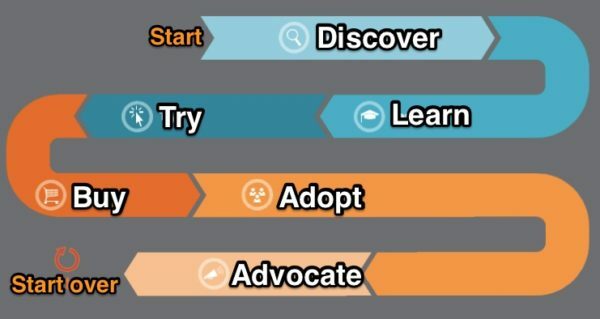 They create content for all stages, including adopt and advocate. To go beyond attracting buyers – all the way to transforming customers into advocates – follow Andrea’s lead. Reach out to a friendly post-sales content team. Look together for opportunities to solve business problems that your customers want guidance on. You may find, sometimes, that you can’t help but mention what your company sells, especially when you’re talking to those who already have it. How can this product be used in my specific application – and how does it truly differ from other products out there? If you can frame your product pitches to answer specific questions, this can be a huge benefit to your customers. Language can perpetuate division. For example, at IBM, as at many companies, post-sales teams have traditionally been seen as producing not “content” but “documentation.” That terminology resonates with my experience. During my decades of working as a technical writer (ahem, technical communicator), I was almost always part of a documentation team. We explained. Marketing writers sold. Us. Them. In an email following up on her conference talk, Andrea told me something fascinating: Some IBMers are moving away from the term “documentation.” They’re now using “content” to describe information that the company provides across the customer journey. That shift in language reflects an attempt to change the company’s culture. If you’re looking to close the gap between presales and post-sales content teams in your company, consider the language you use. Do you talk about “content” as something that only marketers create, or is that the term for what everyone creates? IBM marketers are not alone in discovering the value of content that converts customers to advocates. This final stage in the customer journey – also referred to as retention or loyalty – is the stage where the fewest marketers focus, according to CMI founder Joe Pulizzi. Some marketing funnels include these stages; others stop short of them. Either way, the point is to think about content that serves people beyond the sale as part of your marketing strategy. Several speakers hit on this theme at Content Marketing World 2017. Todd Wheatland, in a talk called Marketing Below the Funnel, argued the best way to fill the top of the funnel is to cater to the content needs of people who already bought from you; happy customers bring in new customers. Marcus Sheridan noted too many marketers start at the top of the funnel rather than answering the questions the sales team gets asked every day, questions that appeal to serious prospects and customers alike: How do I solve problem X? How does X compare with Y? What does X cost? What’s the best way to do X or Y? Eric Hess gave examples of how REI content teams build loyalty and stay relevant between purchases by producing what he calls utility content: checklists, how-to-use guides, care and repair instructions, DIY hacks and tips, location guides, product reviews, buying guides, and videos that pass on skills and knowledge – for example, a video on how to replace a bike chain (as shown here). Andrea shared proof that when you focus on customers’ content needs, you attract prospects. 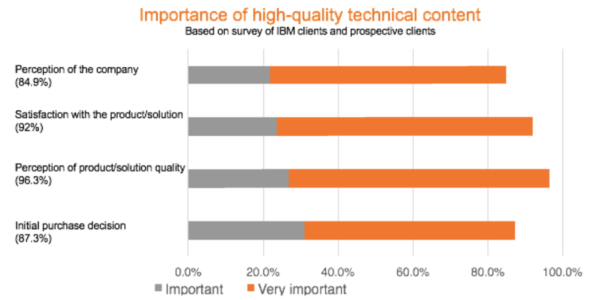 Almost a decade ago, IBM spent several years surveying its customers to determine to what extent prospective buyers value a company’s high-quality technical content – primarily product documentation, the post-sales content. “The survey results opened our eyes,” Andrea says. The data – especially the percentage of customers who said high-quality technical content had influenced buying decisions – left no doubt in IBMers’ minds: Content that helps people get value from what they’ve bought is content that attracts new customers. At the same time, marketers must take an interest in the documentation teams. These people are a little geeky. You may have to change the way you talk to them. It will be worth the effort. You will be the hero of the technical content area. In addition to mutual interest, something else needs to happen for both sides to keep a conversation going. The company must create what Andrea calls “the right ecosystem,” which includes aligned incentives. If the departments are being measured in incompatible ways, efforts to coordinate will fail. For example, if people on the documentation team are evaluated on how much documentation they can cut, they have little reason to brainstorm with marketers on new kinds of content their company’s customers and prospective customers might love. That leader must write down the unified strategy, share it with all who need to know about it, and keep it updated. And the leader must communicate, communicate, communicate within the teams and with stakeholders. “Don’t ever let them not hear from you,” she says. 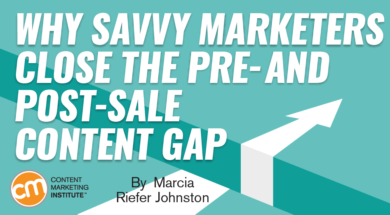 Are your content teams in marketing and product documentation separated by a presales and post-sales gap? If so, it’s time to make like IBM and other like-minded companies and take steps to close the gap. Start the conversation. See where it leads. If you’re already closing this gap at your company, how are you doing it? How is it going? Let us know in a comment below. Ready to close the gap on your content strategy expertise? Plan to attend the Intelligent Content Conference March 20-22. Register before Dec. 15 for the lowest rate possible!